I'm thankful for all the support and clicks for all my past recipes & travel blogs, but I've finally decided for good that I'm moving on from this blog to Wordpress. I'm a little embarrassed (actually, really embarrassed) of some of my writing as a 14-year-old (queue in the excessive exclamation marks) and I've always wanted another name rather than 'Around le globe' which I only thought about on a whim. Please check out Gallivanting eats!!! We've been experiencing some heat waves with temperatures up to 41 C. So what are great ways to cool off if you're going to the city? Obviously eat and drink. 1) Spend minimum time outdoors. Once I made my friend and I walk to Fitzroy for gelato at Messina in 40 degree heat and I instantly regretted it (but was relieved at Messina). That means, try your best not to go shopping along Bourke street. Melbourne Central, Emporium etc are your air-con friends! 2) Get cold drinks and froyo! This is a favourite of mine near Melbourne Central. Be sure to come early during the weekends, and relatively early on weekdays. I usually go around 11-12 ish for brunch, and the normal waiting period is about 20-25 minutes. I made the grave mistake to go on the weekend with my friends, and we turned away when we heard the waiting period would be an hour plus. The coffee is fantastic and the quality of the food is pretty consistent. Iced coffees and mochas are delicious and not too sweet. My friends had the iced tea with mint which was refreshing although a bit too sweet for my liking. So what happened in 2015 since my last blog post about blondies? A lot. My second sister got married, I GRADUATED FROM HIGH SCHOOL, and I went on a trip to Spain & Portugal with my parents & eldest sister. My whole motivation for getting through that awfully painful time of exam prep & exams itself, was the fact that I'd be able to travel to Europe and see my relatives & friends in Malaysia afterwards. So the first night was really just not productive. I woke up feeling so groggy, but we had a delicious local dinner at a restaurant nearby our hotel. We had lots of paella throughout the trip. After our first lesson with Ghislaine at Creipac, we headed off for lunch and our first excursion! We had a quick lunch at 'Quick'. Our teacher, Madame S however agreed with all of us that "Quick, ce n'est pas quick!!! "- Quick, it's not quick! The queue was horrendously long, but when it came to ordering, it came out really quickly. Anyway, it was pretty decent. Better than McDonalds. We ate on the Anse Vata beach. Sun, light breeze, conversations and fast food. What more could you ask for? We headed back to our hotel and we played cards for a while before we were picked up by the Tchou tchou train! It's a small train that makes a tour around Noumea. Such a cute little train! Our tour guide was incredibly heart-warming and joyous. He conducted 3/4s of the tour in French, then the rest in English. He was all like "Here in Noumea, we are happy so let your worries disappear and just relax and be happy!" And we were all really like "Woah he has a cool mojo", we all asked him for a photo later! As we went up the mountain, we saw incredible views. This was at Ouen Toro park. Simplement, je pourrais dire que c'est incroyable. To be honest, at first I wasn't looking forward to our French lessons. And I guess that's single handedly from experience of dreadful Saturday language school. We had 3 hour French lessons each day at the language centre, Creipac. It was about a half an hour drive from the city centre (Noumea). To my surprise, they were some of the best lessons I've ever had. Not only was our teacher incredibly encouraging & helpful, she made our lessons incredibly interactive. Also, having a small class of 7 students, was really comforting. We all felt comfortable making mistakes and talking with each other all en francais. 3 hours went incredibly quickly, and many of us just long to have language classes like that yet again. Our teacher, Ghislaine helped us immensely, I can't thank her enough! It was mostly an emphasis on speaking & listening. The activities we did were fun, for example some of us had to go up and give a short brief description of an imaginary person, based on a single picture we were given. Then, all of us would 'interrogate' the person and ask all sorts of questions. It also really made me realise and value how much the fact that smaller classes are very beneficial for language classes, and learning a language is something that I feel passionate about (I have yet to master Chinese.. uni?) because the problem with a lot language classes in school, it's too big. Sometimes, a teacher can't handle so many people, and consequently students are timid talking in front of the class. Since I go to a public school, we don't have the luxury of small size classes like private schools. But I would definitely give the Creipac experience 10/10! View from the pier opposite. The language centre is nestled in lots of trees, near the mountains! At the end of our lessons, we received fancy certificates saying that we had completed 18 hours of French lessons at the Creipac language centre. Last year I discovered hummingbird cake. Aunty SS made me a hummingbird cake for my birthday, and I loved it! Hummingbird cake is practically another version of carrot cake sans the carrot of course. Add pineapple and banana, voila. 1) I am not artistic AT ALL. I cannot draw to save my life, so making a layer cake look pretty is the last thing on my mind. I am more of a person who will execute and replicate a recipe, or even a piano piece. I can't listen by ear in music, unlike my second sister who can magically play tunes without the piece in front of her. I unfortunately lack creativity (no I'm not a drone)..
2) It's really troublesome you know. 2, 3, 4 layers yeah whatever. Then you have to put a 'crumb coating' and how do you get your icing to look so clean and cut? I wonder. But I do love the look of layer cakes. I'm just lazy. Anyway, punch line is: bundt cakes are so much easier to handle. The glaze? Even easier. Just whip some cream cheese, powdered sugar, vanilla and add a little milk and drizzle. I love uncomplicated things. 2) Place toasted nuts, flour, baking soda & salt in a bowl and mix until combined. 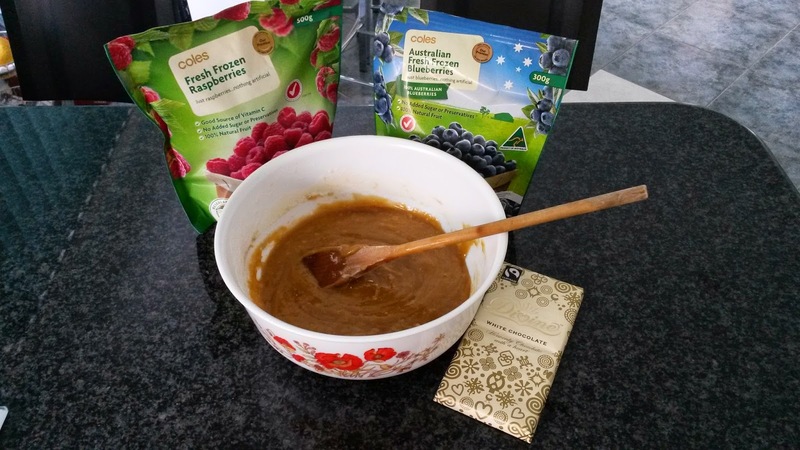 Add in remaining ingredients and mix until combined. Pour batter into prepared bundt pan and bake for 50 minutes or until cake tester inserted in the centre comes out clean. If there is one word to describe my trip to Noumea, it would be bliss. Quite literally a trip of my life. Immersion into culture, bonding with my school friends and enjoying the sun pretty much sums it all. Many people do not know where New Caledonia is. When I try to explain that it's a small French island in the Pacific, near Tahiti and Fiji, many people jump to the conclusion "So basically France?" Pas exactement- not exactly. How about 17,000 km away from France? Nouméa is the capital of New Caledonia. Think crystal blue waters, white sand and lovely weather. Locals think that '18 C is cold'. Quite the contrary for us Melburnians. We experience freezing, wet winters! 18 C is lovely. Its tourism isn't as well developed as many other well known pacific islands but it really does have the potential. So it was a nice change to see that there weren't too many tourists lurking around. A lot of tourists notably from Japan, New Zealand and Australia. I went on an educational tour with my school via GET, which was quite professionally done! 14 students and two teachers. 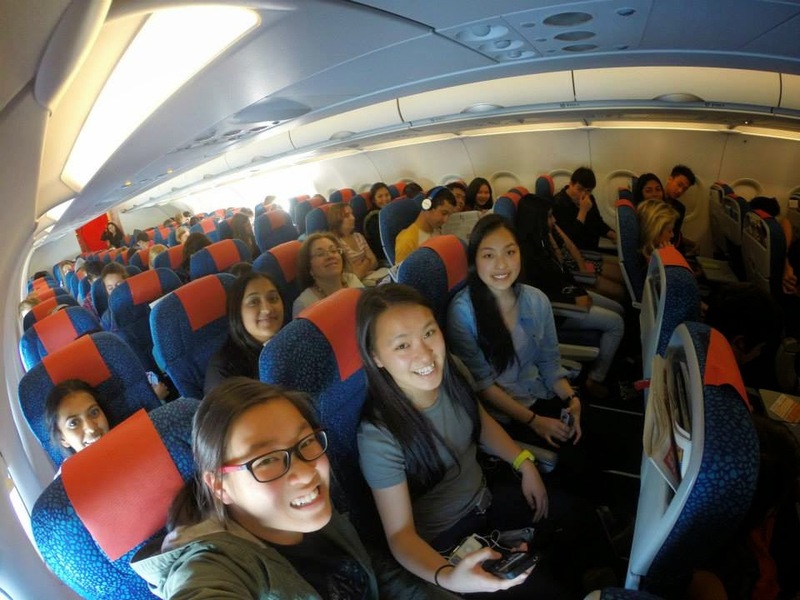 The trip to the airport was actually pretty exciting, because we've pretty much all never been on a school overseas trip. The plane ride was only about 3 and a half hours, not too long. I sat with Eric and one of the school teachers. We watched quite a few episodes of Friends (my all time fave show) and by the end of it, we were struggling to keep our eyes open. Actually, I think everyone was quite exhausted despite the short flight because it was a reeeeally long day at the airport and arrived in the evening. 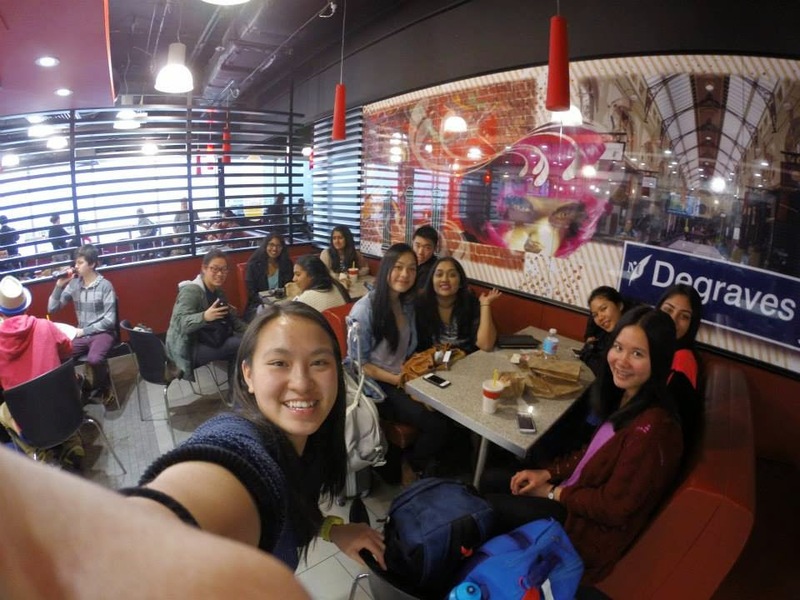 Yi Shan has a Gopro so she took that everywhere. So handy for group selfies ha ha ha. There were also several other schools from Australia. In a later post, I will write about Amedee, an island where we went snorkelling. I would've also loved to see Ile de pins, but we didn't have time to visit there! We had 3 hour French lessons each day at the language centre, Creipac. They were quite literally some of the best oral lessons I've ever had. Not only was our teacher incredibly encouraging & helpful, she made the activities fun and we all learned from our mistakes. More on my French lessons in a later post. Anyway, on the first night, we didn't do much because we arrived in the evening. We all had a pretty magnificent burger and a taste of Orangina- the French version of Fanta except that it is less artificial and more bitter..I quite liked it. First night was at the hotel, so us students played cards all night, trying to keep quiet but that really failed. But what do you expect with a bunch of students running wild in a foreign country? Next morning, trying to keep our eyes open. 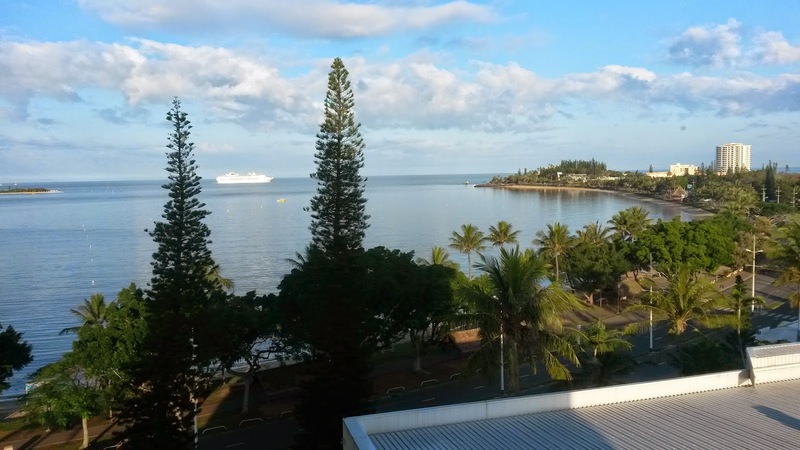 Last week, I came back from my trip to New Caledonia. I was there for 11 days, and they were some of the best days I've had all year (apart from Singapore). The water is so picture perfect, the weather was amazing (Apart from one day where I wore a t-shirt and it was windy & raining. Possibly the worst idea). The trip was for a school French study trip, and I am so glad that I went. I had to really persuade my parents to let me come on this trip (I presented them my case last year), and I am really blessed to have had such a wonderful time there. 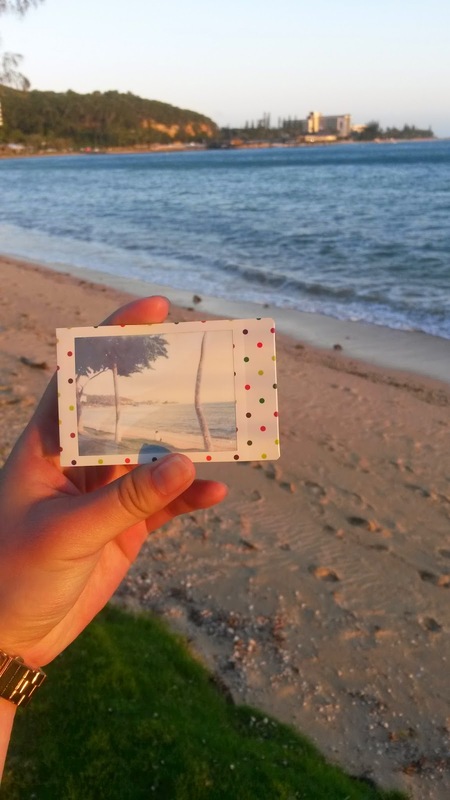 I'll be of course writing & posting pictures of my adventure in New Caledonia, but that won't be for a while because of exams :( But I had such a lovely time there, I MISS THE COUNTRY SO MUCH ALREADY AND SAYING MERCI TO EVERYONE!